I'm not overly familiar with the French rock and metal scene. I seem to recall Noir Desir which caused some stir in France (and Europe) in the late 80's. Abinaya (Sanskrit, passing on) may travel this road, but again, I'm not quite sure. Their second album, Corps, could easily have a place in modern heavy rock from Europe, but more likely America. There's a strong foundation of metal riffage throughout that can be both dynamic and raw. Sometimes you can hear some innovation bearing a resemblance to progressive rock (Algo Mais or Testament), a real highpoint for them. The entire album is sung in French which is expected considering the French tendency towards ethnocentric arrogance, a singularly annoying attribute. Another irritating nuance was sending this work on CD-r with only a promo sheet: very unprofessional. Otherwise, Abinaya's musicianship is exceptional and the production crisp. Unfortunately, except for their native countrymen or ex-patriots around the globe, Corps will probably hold little interest for the rest of the rock world. 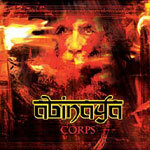 Abinaya's Corps is a fine work in the French rock tradition with elements more akin to modern heavy rock. Unfortunately, except for their native countrymen and ex-patriots around the globe, Corps will probably hold little interest for the rest of the rock world.